I was appointed to the post of Headteacher at Castleview in 2005. I have been fortunate in being able to create a wonderful team who have made Castleview such a high achieving school. The HMIe Inspection of 2013 gave the school excellent evaluations which rates the Castleview school experience as one of the best in Scotland. During my tenure as Headteacher I have been privileged to be asked to serve my country and my city. In 2011 I was a member of the Cabinet Secretary for Education and Life Long Learning’s Attainment Group. In 2013/14 I was seconded to the Dept. of Children and Families to support the raising of attainment across the city and to create a leadership programme for Headteachers. I returned to Craigmillar in May 2014 to resume my post at Castleview with the additional responsibility of seconded Headteacher Broad General Education at Castlebrae Community High School . Craigmillar deserves to have a strong High School at the centre of its community and I was proud to be given the chance to support this aim. As of August 2015 I resumed my full time role at Castleview. I hope that you enjoy looking at our website and that you will leave a comment for pupils and staff to read. Our website tries to give you a flavour of teaching and learning in our school but I would urge you to visit our school to view the excellent work of our school family. 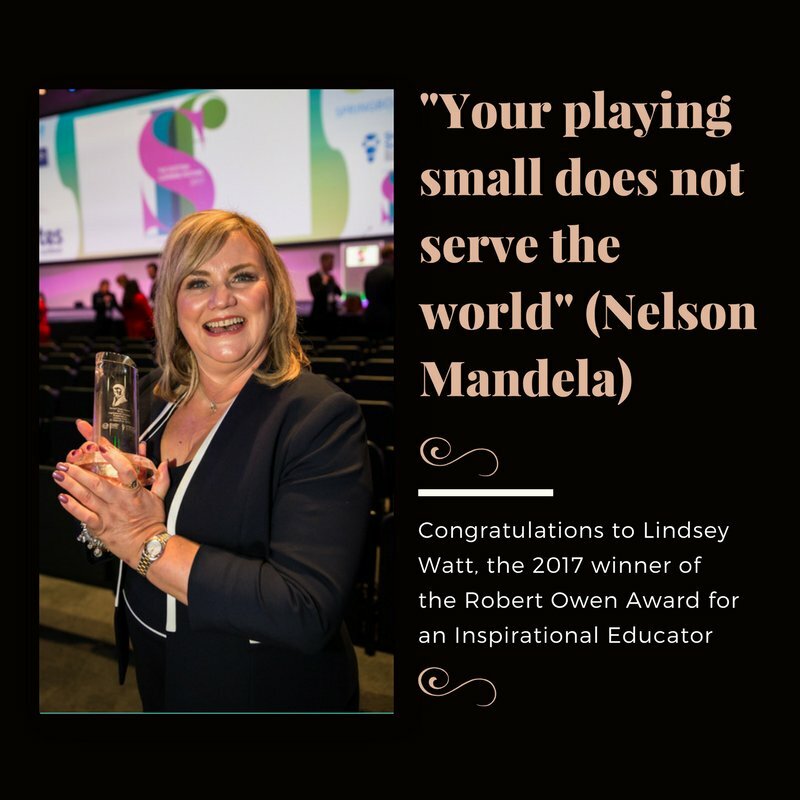 Ms Lindsey Watt was awarded the Robert Owen Award for an Inpirational Educator 2017 on 20 September at the Scottish Learning Festival by the Deputy First Minister Mr John Swinney. The award was established to recognise the contribution of renowned educationalist from anywhere in the world, whose work has had significant impact and has informed substantial education imporvement activities in Scotland. Ms Watt is only the 5th person in the world to have won this prestigious award. Mr Swinney said that “Ms Watt’s work had influenced system change in Scotland, demonstrating very clearly the vitally important role of headteachers as empowered leaders. I believe your inspirational contribution to Scottish education has been of great value to us over many years and contributed to the increasing interest in Scotland from international educationalists”. Ms Watt has been invited to join The International Council of Education Advisers (ICEA) established in 2016 to advise Ministers on how best to achieve excellence and equity in our Scottish education system.